You don’t want to give your dog an ordinary name like Fido or Spot. And you love books. So, naturally, you turn to your favorite literary classics when it’s time to name the new puppy. The result? This list of actual canine names inspired by literature (from The Giant Book of Dog Names). A chiwawa named Kafka? 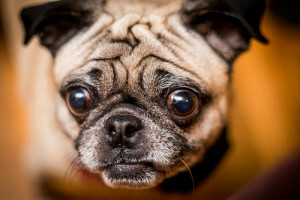 A pug named Nietzsche? Well, why not? Still, it takes a very special — or just very bookish — person to name her dog Voldemort. Not that I have anything against literary dog names. In fact, we named our own Yorkie-poo Captain Colossal, after a character in a young adult novel by Daniel Pinkwater, thus going with both literature AND irony. Does Captain mind being saddled with a (gently) mocking moniker? Not at all. He’s probably just glad we didn’t name him Mrs. Danvers. 3 Responses to Would You Name YOUR Dog Voldemort? My dog’s name is Beowulf ….